Atlantic City residents signed petitions to preserve their right to vote on any sale of the city’s water utility. 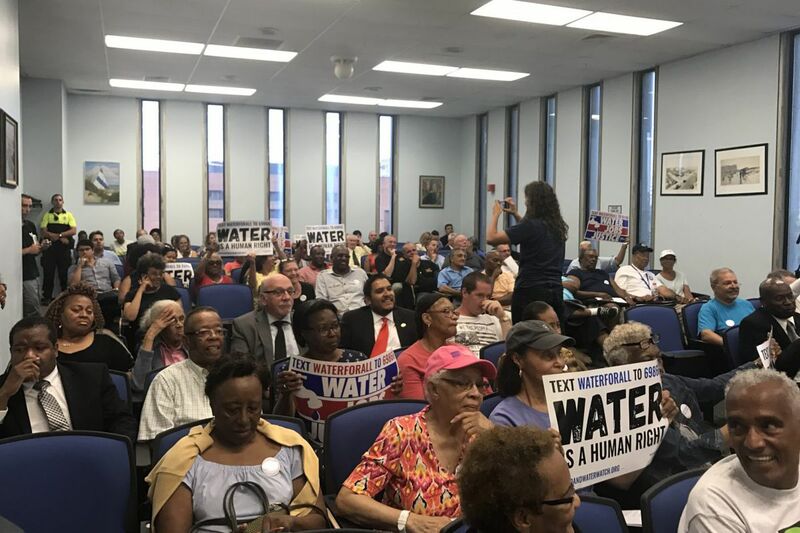 ATLANTIC CITY — Before a packed room and spurred by thousands of petition signatures, the Atlantic City Council voted Tuesday to preserve the right of its citizens to vote on any action by the state to sell or lease the city's coveted water authority. "This is the people's ordinance," said Charles Goodman, an activist with the local NAACP, which helped in the petition drive and various efforts to challenge the power of the state under takeover legislation. The ordinance passed by 8-0 with one abstention. But whether any future referendum would be recognized by the city's state overseers remains in question. The Municipal Stabilization and Recovery Act — the takeover legislation — gives Trenton the power to sell or otherwise dispose of the Municipal Utilities Authority (MUA) or any other asset. The law also states that any referendum voted on by the citizens of Atlantic City would be nonbinding, a provision of the takeover law that civil rights attorneys say clashes with other state laws and are prepared to challenge. The ordinance, the result of a three-month petition drive that collected more than 2,400 signatures, is designed to preserve the right of Atlantic City residents to vote on any dissolution of the MUA and sale or lease of the water system. More than 100 volunteers went door to door to collect signatures. The state has not yet made any public moves concerning the MUA, although several politically connected water companies have long expressed interest. A dissolution of the authority followed by a sale or lease could give the city a cash infusion of upward of $100 million, but is opposed by residents and activists who fear a rate hike and an erosion of the city's much-praised water quality. "Thank you for your courage in this process," Bruce Ward, the MUA's executive director, told the council prior to the vote. Tim Cunningham, the state's head of local government services, who is the official overseer of the takeover for Gov. Christie (the $400-an-hour attorney Jeffrey Chiesa is his designee), refused to comment on the water issue or any other issue prior to the meeting Tuesday night. He did speak at the meeting about the city's budget, and said he had approved $13 million in transitional aid for the city. The state has veto power over the council agenda. At a previous meeting, Cunningham said the petition was "premature" as the state had not made any determination about the MUA. The state has been preoccupied with trying to reduce the numbers in the city's police and fire departments, change public contracts, and negotiate outstanding casino tax appeals. Water advocates contend that a sale to a private company would result in a 79 percent rate increase and put the quality of Atlantic City's water at risk. The MUA has also long been a reliable employer of city residents. In other business, the council approved a resolution authorizing a Request for Proposals (RFP) for the purchase and redevelopment of Bader Field, the former municipal airstrip at the edge of Atlantic City. City Council President Marty Small noted that the state already has the power to sell the city's 143-acre asset, once valued in excess of $800 million, with or without council action, but he said he favored the open process of an RFP. "We're not giving anything away under my watch if I can help it," he said. "But let's be real. If the state wants to do it tomorrow morning, the state can do it tomorrow morning." Councilman Frank Gilliam, who is running for mayor, suggested a better process would be for the city to name a redeveloper for Bader Field. He and three allies voted against the RFP, but the resolution passed 5-4. The waterfront property has sat underused in the decade since the city shut down the historic airstrip, the first aviation facility in the world to be called an "airport." It has since been the site of seafood and Bangladeshi festivals, live music, and a place for a group of wind sailors to gather periodically. For a recovering but still basically broke city currently under state control, the site is a potentially valuable asset. As for who might want to buy it, Stockton University president Harvey Kesselman has said the college, now building a campus on the Boardwalk not far from Bader Field, would be interested in acquiring it for sports facilities and to develop a marine research facility. A previous plan put forth by the city, which called for Bader Field to be sold for $110 million to the MUA, was vetoed by the state, which then proceeded to take control of Atlantic City's government. An earlier auction produced only a bid of $50 million, considered too low to accept. Bader is a sore subject for many in Atlantic City, because in 2008 Penn National Gaming offered $800 million for the property, which officials, including those at the Casino Reinvestment Development Authority, considered to be too low and not credible. At the time, Bader was thought to be worth upward of $1 billion.